Hunter Wellington Boots at Outdoor & CountryThe weather is turning, the days are getting shorter and the temperature is staring to drop, luckily Outdoor & Country has just what is needed to see you through. For a warmer winter, there is nothing like a quality pair of wellington boots coupled with some Welly Socks to keep the damp out and the warmth in.Hunter produces wellingtons to cater to a wide range of activities and have accordingly become popular across all age ranges. Outdoor & Country has ample stock of Hunter Wellingtons , with a great variety of styles to choose from, including funky festival wellies and classic Hunter designs like the Balmoral. You can also show how patriotic you are with the Hunter Original Brit Wellington Boots which brandish the Union Jack at the leg of the boot.Outdoor & Country is now offering up to 50% off selected stock of Hunter Wellies, just in time for the rain and snow. 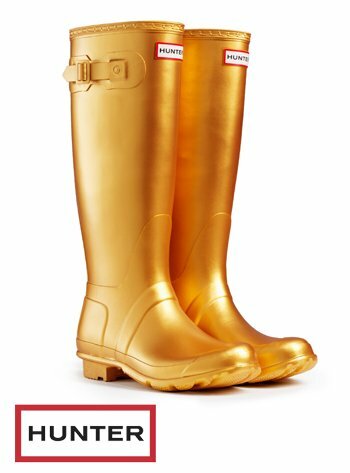 The Hunter Original Great Metallic Wellington Boots, available in gold, silver and bronze, giving the Original Hunter Boot a makeover with vibrant metallic colours have been reduced. Browse our discounted Hunter stock here.Don’t forget to complete the look with Hunter accessories and Hunter Welly Socks, made to be worn with your Hunter Boots. There really couldn’t be a better time to pick up your winter wellies at Outdoor & Country.